For my birthday earlier in the year, my lovely brother and his incredibly talented partern, http://www.missfortune.co.uk got me some Amazon vouchers. It was perfect timing, because I’d just decided to treat myself to some circular knitting needles, as it’s an area of knitting I’d never tried. I found some bamboo ones and something about them seemed to shout to me…and so I bought them. And, seeing as the company selling them also had bamboo straight one…well, it would have been rude not to, right? I have to say, they’re a joy to use. I no longer get cramp in my hand or tired shoulders, and I love the feel of them, both in my hands and when the slide against one another, you dont get that metal-against-metal buzz that can set your teeth on edge. So what to choose for my first foray into circular knitting? Well, as these things often do, the right thing came along when I needed it. My friend Kelly is due Baby number 2 in a couple of weeks. But I’d done her bootees for the first one and wanted something a bit more. And then I found this http://www.ravelry.com/patterns/library/bunny-beanie How gorgeous is that?! and it was pretty straightforward, if a little weird feeling, and then I got to the crown. I only had about 9 stiches on and they barely filled the straight bit of the needle, let alone going all the way round. 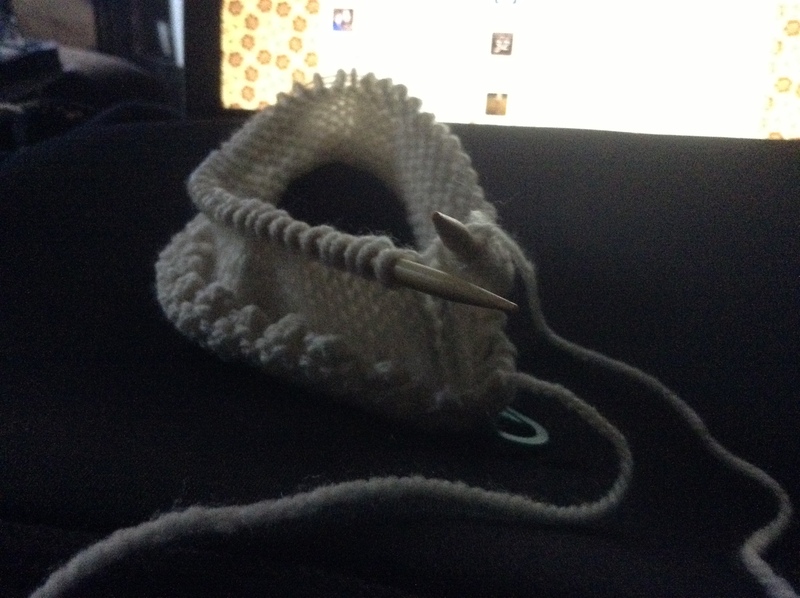 So I improvise, and used the next size needle and continued as if they were either end of a circular set. And I really don’t think you can tell. But if anyone has tips on that, let me know! 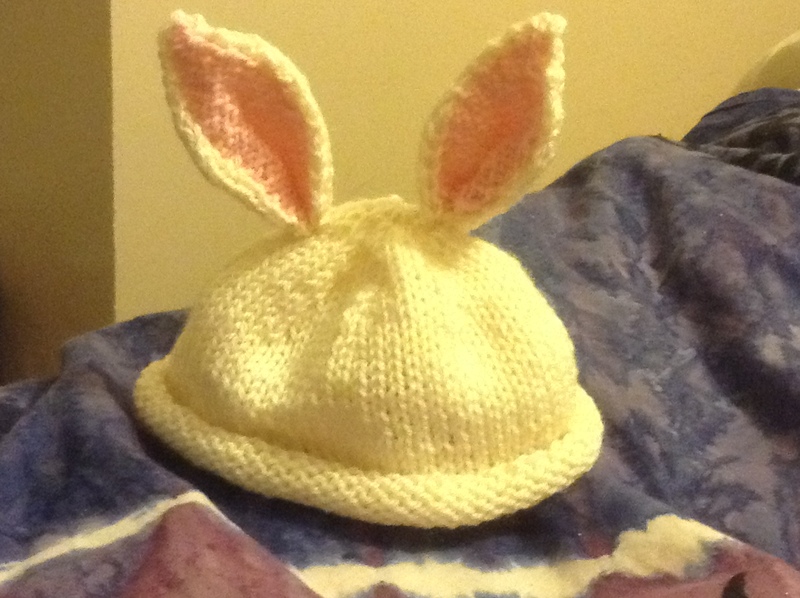 So there was a hat….and now it needed ears. I actually think the ears were harder than the hat itself! I think if I were to do it again, I’d probably come up with a different take on it, they really were fiddly. But I think it was worth it…..
Kelly loved it – and the amount of people who said “I want one in my size!” was quite terrifying! (Not that I hadn’t thought it myself!) 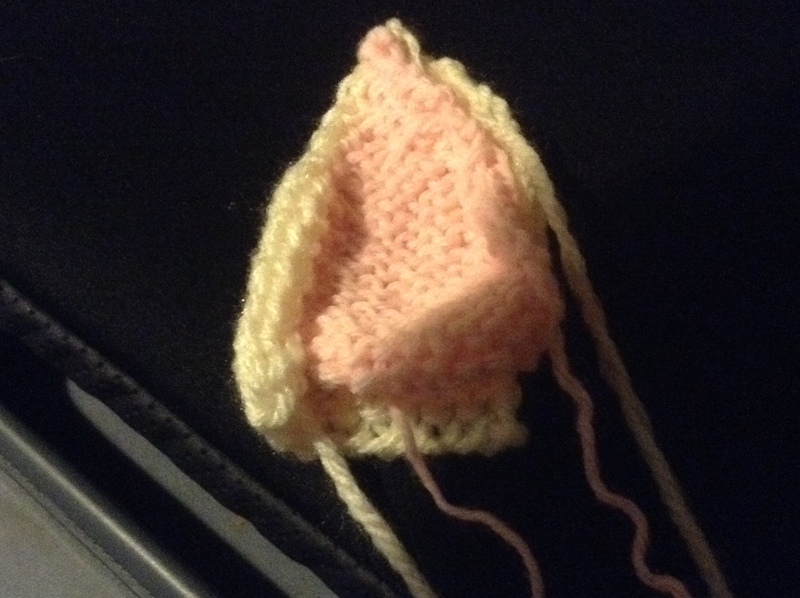 So all in all, a fairly happy first use of circular needles, with a little help. 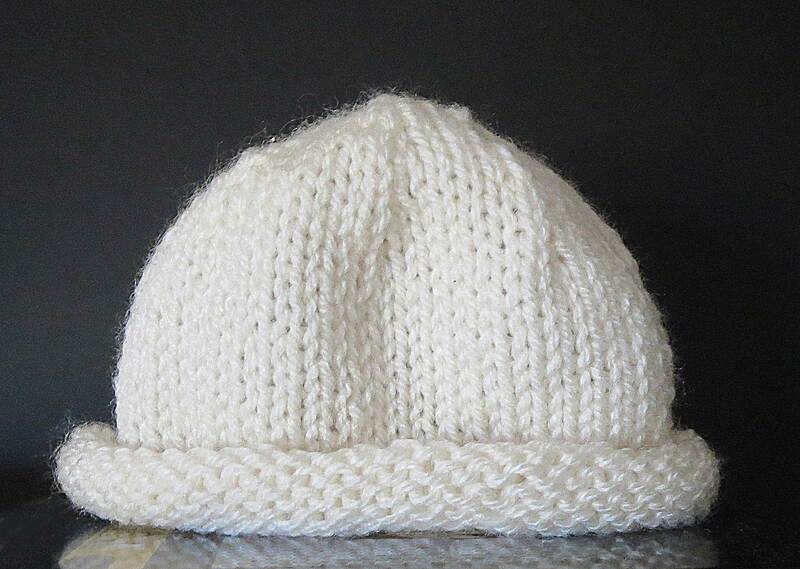 This entry was posted in knitting, life and tagged baby, bunny, hat, knitting.